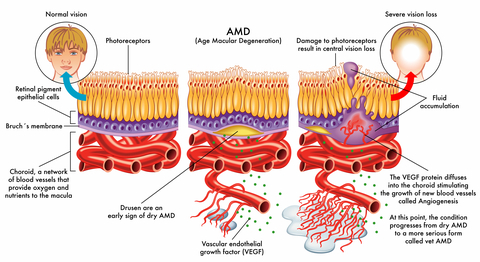 All three of these layers of tissue play an important role in your macular health. Although very thin, Bruch's membrane is an integral structure and any breakdown in this membrane can impair your vision. √ Acts as a support structure to the choroid - the vascular layer The RPE transports metabolic waste from the photoreceptors across Bruch's membrane to the choroid. Bruch's membrane gets thicker as we get older. This may impede some of the transportation of waste material which can cause a build up of deposits. The thickening also prevents nutrients and oxygen from being delivered to the macula. These deposits are formed on and in Bruch's Membrane. allows the choroid vessels to breakthrough and grow into the membrane and beyond. In choroidal neovascularization, (CNV), capillaries coming from the choroid must cross Bruch's membrane to reach the subretinal pigment epithelial space. 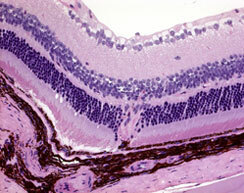 Some kind of gap in Bruch's membrane must develop before a person experiences CNV. Read about this interesting observational study called Accumulation of Cholesterol with Age in Human Bruch’s Membrane from (Investigative Ophthalmology and Visual Science. 2001;42:265-274. )© 2001 by The Association for Research in Vision and Ophthalmology, Inc.
Their Purpose: "To determine the cholesterol composition of normal human Bruch’s membrane and choroid as a function of age and retinal location." Their Conclusions: "Human Bruch’s membrane ages like arterial intima and other connective tissues for which plasma lipoproteins are the known source of extracellular cholesterol. 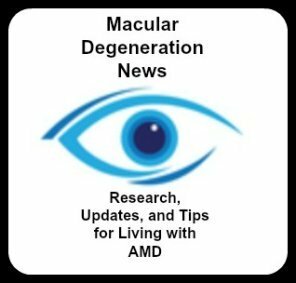 Age-related maculopathy and atherosclerotic cardiovascular disease may share common pathogenic mechanisms."